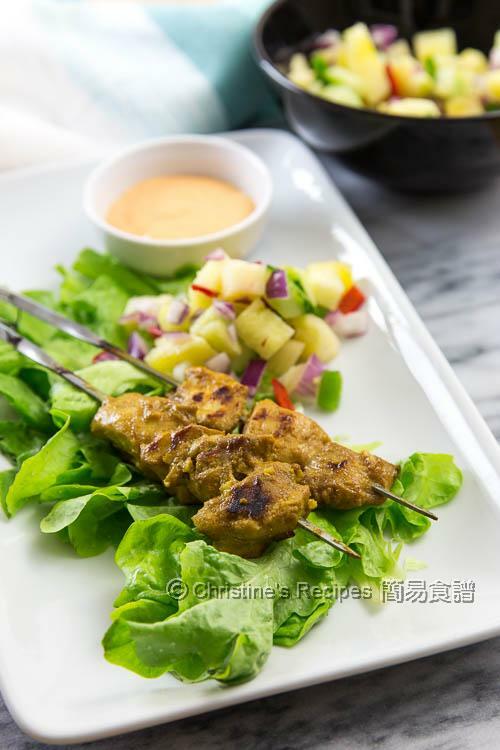 Who can resist tender and moist grilled chicken skewers? It's perfect to be served with salad or salsa. If you like a bowl of steamed rice, why not? To make these chicken skewers, it’s totally fuss free and handy. All you need to do is to prepare the marinade by mixing all the ingredients. Then use your patience to grill the skewers over medium-low heat, or simply put the skewers in your oven. It won’t be wrong, no matter they are served as a family meal or finger-food in a party. 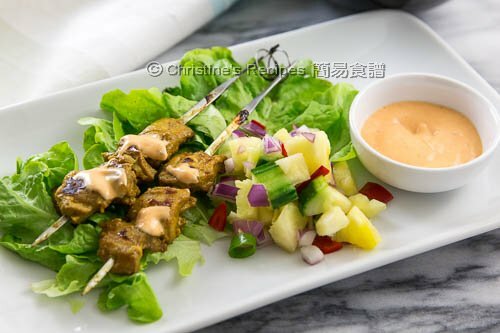 These spicy grilled chicken skewers can be served with salad, or the pineapple salsa that I posted previously. The tastes of the grilled meat and salsa are well-balanced. Cut the chicken into 3 cm-sized cubes. To make the sauce, mix all the ingredients well in a little bowl. Set aside. In a food processor, put in the garlic, yoghurt, Tabasco sauce, balsamic vinegar, brown sugar, paprika powder, ground cumin, ground turmeric, salt and olive oil. Process into a paste. Combine with the chicken well in a plastic bag or container. Refrigerate for at least 3 hours, or overnight. Remove the chicken from fridge and rest in room temperature for about 15 minutes. Thread onto skewers. 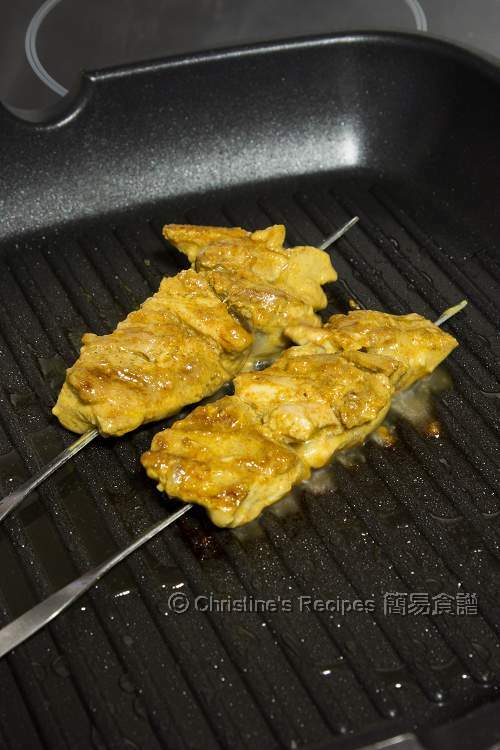 Cook skewers on a heated grill pan, or a BBQ griller, for 15 to 20 minutes on medium-low heat, until cooked through. Serve hot with sauce and salsa. Enjoy ! As the marinade contains sugar, don’t cook over high heat. Or else, the skewers will be burnt before cooked through. All spices are available at supermarkets or Asian grocers. The cooking time depends on the thickness of your chicken meat. If you don’t use a food processor, you can finely chop the garlic cloves and mix them with other ingredients well for marinating. Love your curry marinade! Can't wait to give this a try since I eat lots of chicken.